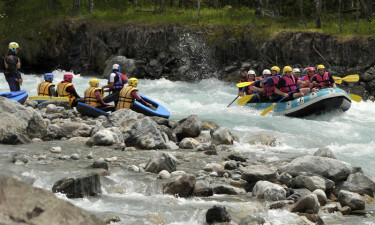 Le Belledonne is a luxury camping site located within the picturesque French Alps. 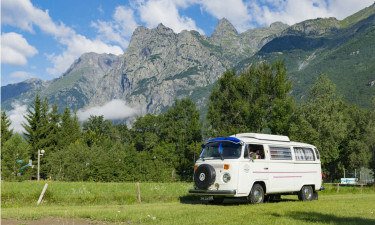 As it lies within the heart of Les Ecrins National Park, guests can look forward to enjoying a camping holiday defined by relaxation, comfort and beauty. Please feel free to contact LUX-camp to learn further details. A panoramic view of the French Alps. A variety of mobile homes and tents. Le Belledonne embraces a sense of luxury camping by providing guests numerous chances to relax. In fact, both a sauna and an open-air pool can be enjoyed by every guest, and with all amenities being just a short walk away from the luxury mobile homes, there’s nothing left to do except sit back and relax. As there is a designated play area for children within this holiday camping site, parents are able to enjoy a respite from their normally hectic lives. Although this luxury camping site is found within the confines of a natural park, no expense has been spared in terms of conveniences and technology. All visitors are provided with wireless Internet within their mobile homes and there is a washing machine and a tumble dryer available for those who wish to wash their clothes. Dedicated power supplies to individual pitches are likewise present and a fully equipped supermarket is located within the resort itself. One will never have to go far to secure necessary provisions or camping gear. Above all, Le Belledonne is known as a holiday camping site that is set within what can only be called some of the most beautiful natural surroundings in Europe. It is found 6 kilometres from a lake and the majestic Alps are quite literally outside of one's door. Those who wish to explore this region in more detail can utilise an on-site bicycle hire service. When in France, it only makes sense to indulge in some of the renowned fine cuisine and guests here can enjoy the tranquil settings provided by an on-site restaurant. This venue overlooks an open-air pool and there is a large terrace for those who wish to dine outdoors. The restaurant also provides a takeaway service during the height of the tourist season. Anyone who desires to quench their thirst will be pleased to know that there is also a bar to be visited. Such an unforgettable camping holiday is made even more pleasant due to a supermarket located within walking distance of all pitches. Shoppers can purchase everyday camping supplies, fruits, vegetables, meats and even fish. These are all perfect for those who wish to dine within their mobile home or who require basic amenities without having to travel very far. To learn more, please contact LUX-camp and speak with a representative.